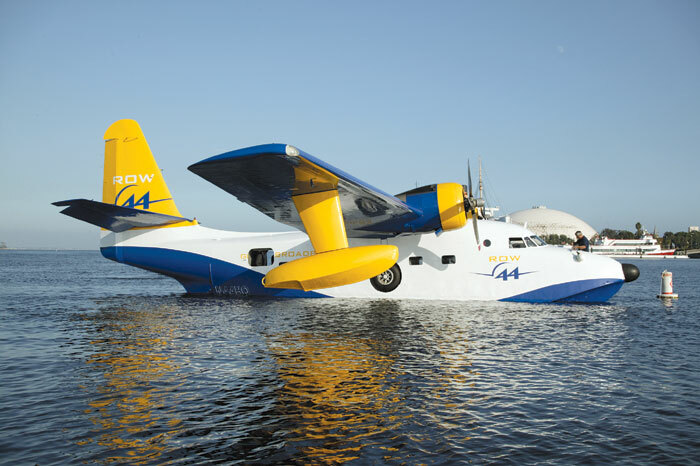 AVALON — A restored 1950 Albatross seaplane will be on hand at the inaugural Catalina Air Show Sept. 29-30, harkening back to the days when similar aircraft such as the Grumman Goose and Mallard could be seen off Avalon’s coast. The amphibious plane, based in Camarillo, is now owned by Row 44, designers of in-flight Wi-Fi services. The flying boat was originally designed for the Air Force for ocean search and rescue of downed airmen, and this particular model was also used by NASA as part of the training program for shuttle astronauts. During their training, the astronauts signed one of the cabin walls. The plane’s interior has been completely redesigned with all-new leather chairs and tables, and even a refrigerator. The Albatross has a 97-foot wingspan and is 65 feet long, nose to tail. It will land off the breakwater of Avalon Sept. 28 and is tentatively set to remain moored that night, and during the air show Sept. 29. The seaplane will then depart Avalon Harbor and fly up to Catalina’s Airport in the Sky, where it will be on static display Sept. 30 for the viewing public. While the best views of the Catalina Air Show will be aboard any boat moored in Avalon Harbor, landlubbers have some premier viewing locations to choose from, as well. The first — Castillo del Mar; a cliff-side home nestled under the Chimes Tower, offers one of the best views in Avalon overlooking the Catalina Casino. Guests will be treated to refreshments and a catered lunch by Steve’s Steakhouse. There will be comfortable front-row seating with views of Avalon Bay and the airspace above it. All guests will receive a souvenir Air Show shirt to take home. Castillo del Mar was built in the late 1920s and is the home of Blanny Avalon Hagenah, a great granddaughter of William and Ada Wrigley. Hagenah will be personally hosting the VIP viewing of the Catalina Air Show. Ticket donations are $125 per person and can be purchased at catalinaairshow.com. The second VIP viewing location will be at Hamilton Cove’s Clubhouse, a private gated condominium development in the city of Avalon. The clubhouse has a view of the ocean, and attendees will be treated to refreshments and mini sandwiches. This location will require a taxi ride. Ticket donations are $75 and can be purchased at catalinaairshow.com. For more information, call Maggie Make at (310) 510-2199.